This is our custom-built Mogami 2319 1/8"-3.5mm locking to XLR F for Sennheiser wireless systems with a mic. This is a custom cable similar to Sennheiser's CM1 that connects a dynamic mic like the SM-58 or SM-57 to a wireless bodypack. Construction is Neutrik and Switchcraft connectors with Mogami 2319 cable. Neutrik and Switchcraft connectors are some of the best connectors around. 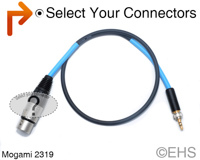 Mogami 2319 cable is very flexible, durable, light-weight cable. Photo 1 shows a 2ft cable with Nickel XLR and 1/8" and blue shrink label. Photo 2 shows one option for the cable with Nickel XLR and 1/8" blue shrink label.